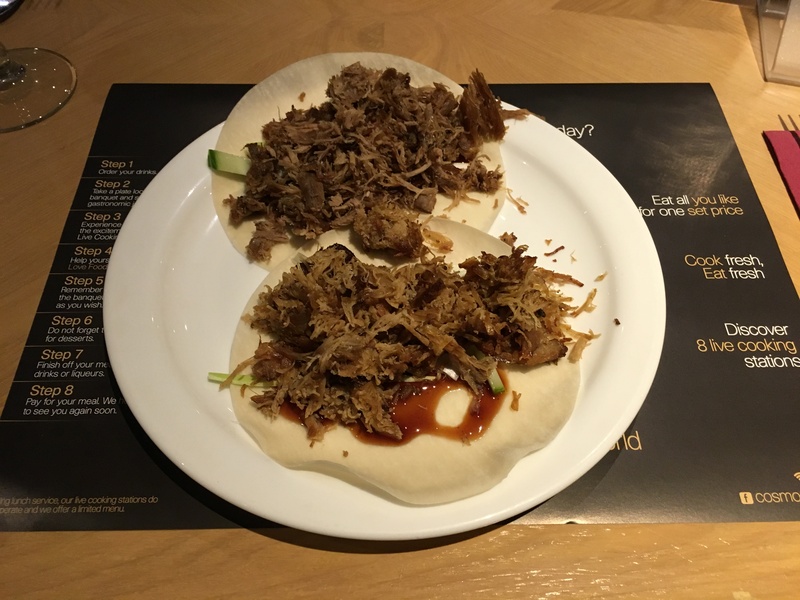 This is my second attempt to review Coppa Club. The first time, I went on a winter night last year only to be escorted to a table for two next to the big French doors, a table so cold that it could turn tomato soup into gazpacho in minutes. I asked to be moved and slack-jawed confusion broke out among the black-shirted serving staff. Minutes later I was told this wasn’t possible, even though I was pretty sure I could see other tables were vacant. When I said thanks but no thanks and voted with my feet, I’m not sure they even noticed me leaving. Perhaps there was nothing they could do, but it would have felt nice if they’d tried, suggested a drink in the bar or pointed out when a suitable table might become available. I couldn’t work out whether they were fazed or unfussed, but either way I was in no hurry to go back. In the meantime, friends of mine have enthused about the place. More for lunches than dinners, I was told, but even so I got a steady stream of positive feedback which made me think it was time to give it another chance. And it’s the kind of place I see appearing in my Twitter feed all the time – lovely pictures of well-presented dishes, not to mention one of the most attractive dining rooms I’ve seen in a long time. So eventually, now that the days are getting warmer, I decided I could leave it no longer. Besides, after the delights of all you can eat dining I found myself pining for something clever and delicate. And yes, it really is a beautiful room. It ticks all the boxes without looking studied or cynical – a bit of exposed brickwork, granted, but some lovely furniture in muted greens and blues, button back banquettes and beautiful burnished geometric metal lampshades (no bare swinging hipster bulbs here, thank you very much). It feels like someone has thrown money at this place – how very Sonning – until it started to bounce off, and that prosperity starts out very alluring, although by the end of the evening I could see how it might get a little smug. Turning up on a Sunday night I was delighted to get one of the booths. There’s a blue banquette running along the middle of the room but the booths, which are closer to the exposed brickwork and the bar, were nicer and cosier. Quite roomy for two people, too, although if there were four of you in one you’d need to get along reasonably well. That seemed a bit of a theme in general, actually – looking at the tables for six I found myself thinking that they’d more sensibly seat four. Perhaps that’s why, on my previous visit, they weren’t prepared to find anywhere else for a table for two to eat. Perhaps, too, packing diners in is how Coppa Club could afford to spend so much money on refurbishing the place (or perhaps I’m being a bit harsh, in which case I’m sure some of you will tell me). I liked the menu enormously, and it felt like it had just enough things to pick between without being bewildering. It reminded me a lot of places like Jamie’s Italian, so I wasn’t entirely surprised later when doing some research to discover that the chef at Coppa Club has worked there. It’s a more compact menu than at Jamie’s, but still presented a few complicated decisions – to share or not to share, to order pasta, that kind of thing. Horse trading took longer than usual, which was just as well because getting anybody interested enough to take an order did too. Now, normally I talk about service right at the end of a review as part of wrapping things up but with Coppa Club I really feel I have to make an exception, because it was so uniformly poor every step of the way. Don’t get me wrong – it was friendly and affable, but beyond that they managed to get pretty much everything wrong. You could never get any attention, despite it not being a busy night. The starters turned up immediately after they were ordered, at the same time as the nibbles we’d ordered to tide us over. Getting someone to bring the bill at the end was a challenge, as was paying it once it had been brought to the table. Many of the serving staff seemed to have been trained to completely ignore customers altogether, usually while walking past or near their tables, and when I left after what felt like an eternity settling up I saw one of the waiters chatting to his friends at the bar. I don’t take any pleasure in saying this, but it was especially jarring considering what a lovely room it was and how good some of the food turned out to be. And that’s not even getting on to some of the things which, although they bugged me, might not be deal-breakers for you. I regularly saw waiters leaning right across diner A to serve diner B, something which (in my book at least) you really should not do. Another thing, which may sound minor to you, was about where we were sitting. The booths were open on one side (the side nearest the other tables) but closed off on the other, and behind them was a little corridor section where the serving staff could get water, wine, glasses and so forth. Our waiter kept taking orders or handing us wine over that barrier, which just felt downright strange, like talking to your neighbour over the garden fence without ever having been introduced. Perhaps this is a new trend in informal dining which has passed me by, but I just didn’t like it: it felt more like laziness. Let’s move on to the happier subject of the food, because some of this was really pretty good. 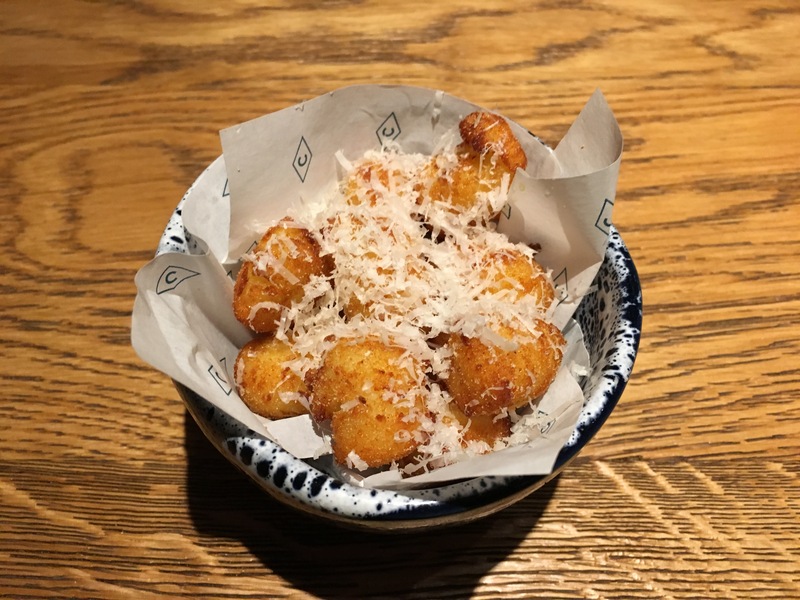 The nibbles – deep fried gnocchi with parmesan and truffle oil – were pleasant (although I’d have enjoyed them more if they’d arrived some time before the starters – sorry to keep going on about that), little breaded nuggets of tasty starch. The truffle oil, as so often, added an olfactory tease that never followed through when you actually ate the food, but never mind. 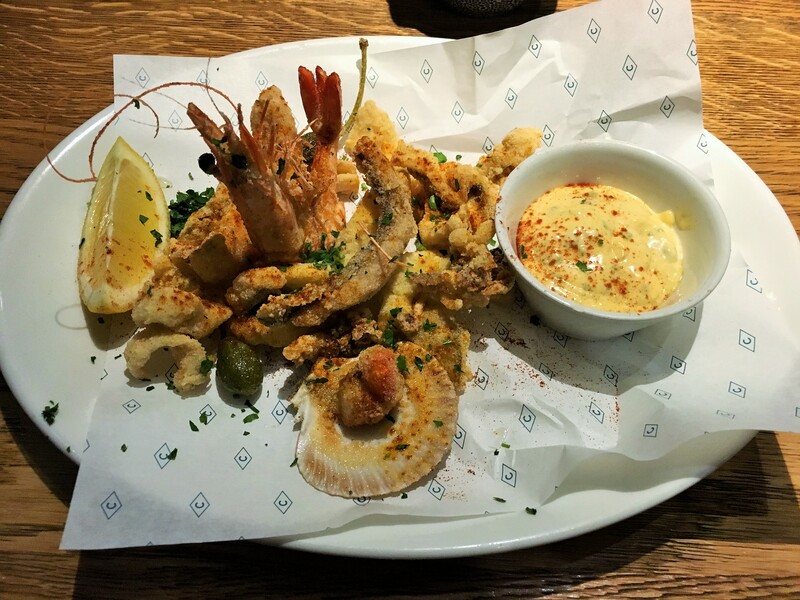 Better was the fritto misto – a very generous helping of squid and white fish, seasoned and dusted in what might have been semolina flour, along with a solitary prawn and a slice of scallop. 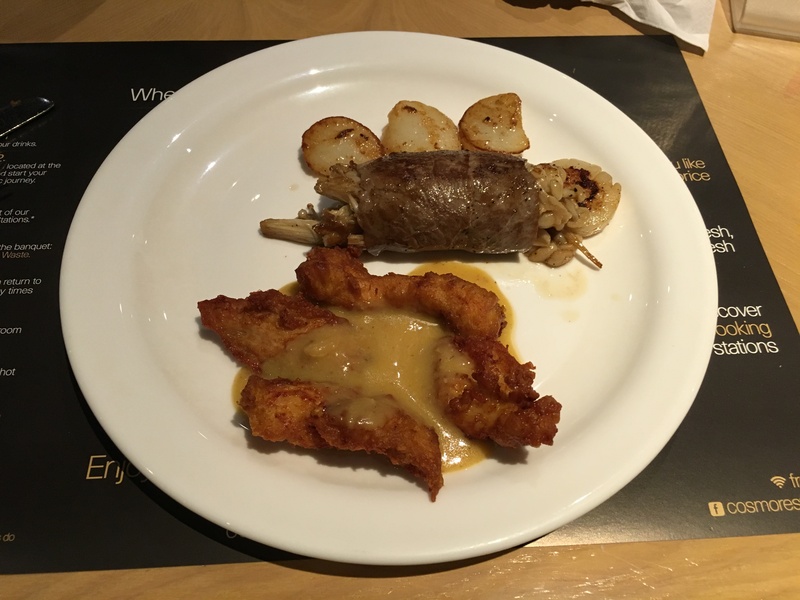 This was very nice stuff – far better than many places’ efforts at fritto misto – and my favourite bit was the small pieces of squid, all crispy tentacles with that rough, savoury coating, texture triumphing over taste. The tartare sauce it came with was quite nice but maybe a little too sophisticated, too Sonning, for my taste. I reckoned it needed more vinegar and acid, more gherkin or capers or – starting to drool now – both, but I’m a sucker for pickles and it might just be me being a Philistine. The other starter, “beets and ricotta bruschetta”, was lovely; a single slice of ciabatta-like bread with a layer of bright pink whipped ricotta topped with cubes of beetroot. That alone would have been enough to meet the job description, but there was a little more: wafer thin beetroot crisps in red and gold on top to add another level of texture, then some pretty salad leaves dressed with olive oil (I think) and cheese shavings, because cheese shavings make everything better. I liked it a lot: refreshingly clean but with that earthiness that beetroot brings, all dark and zingy. 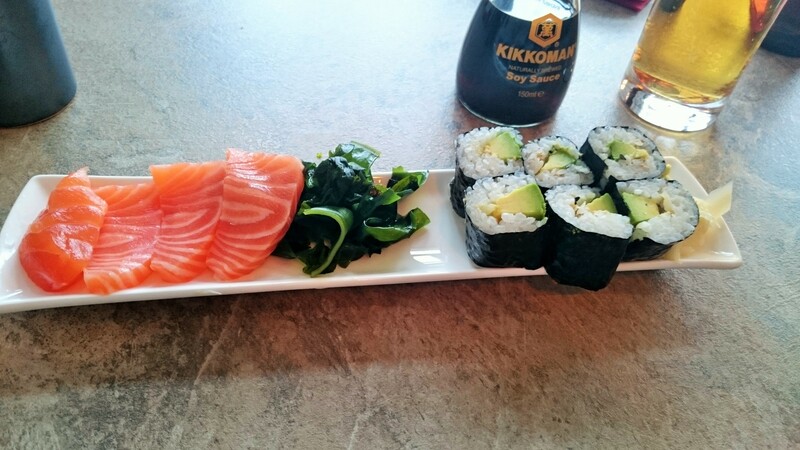 It was a dish that looked like winter but tasted of spring, and it made me long for longer days. The starters had come so quickly that I was worried I would be out of Coppa Club in next to no time, but thankfully they slowed it down for the mains. If anything, this gave me and my companion a chance to play spot the difference between my glass of entry level Syrah and her glass of more expensive Shiraz (we couldn’t really find one, which is maybe why I try not to say too much about wine). It also meant that the mains arrived pretty much when we were ready, probably the only piece of good timing about the whole evening. I’d found choosing a main at Coppa Club surprisingly difficult. My companion had already bagged the pizza, having pasta as a main felt a bit too monotonous, ordering the burger felt like it would have been a poor show and I wasn’t in the mood for a whole fish on the bone, lovely though that sounded. 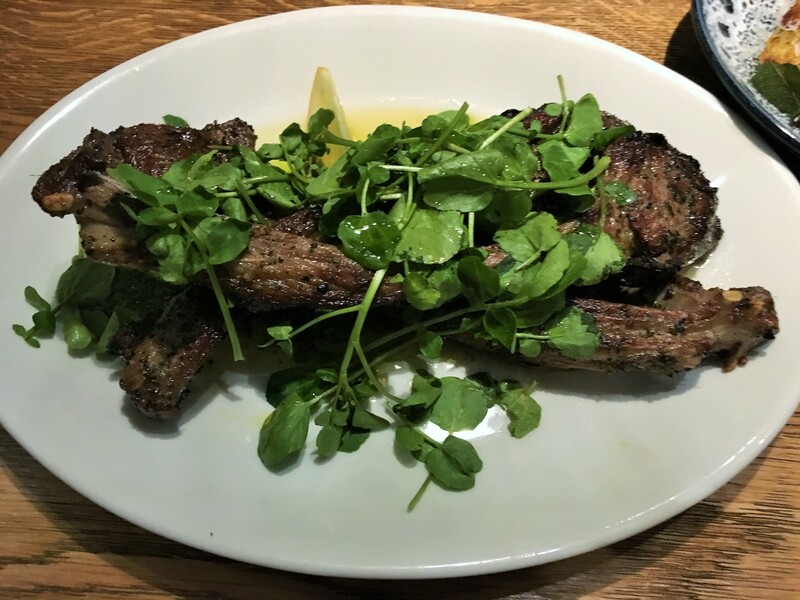 So the lamb chops – described as “scorched fingers” on the menu, perhaps that’s a draw for some people – won by default and, in hindsight, I’m delighted that they did. 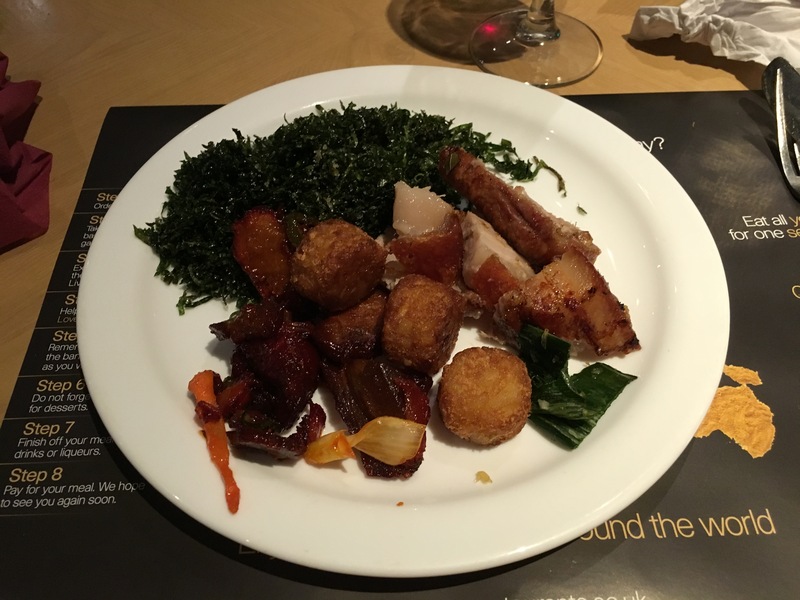 This was a dish for people who like meat and fat – three long, thin, chops with a square of tender meat at the end but, more importantly, rich seams of fatty meat along the bone, caramelised, melting and utterly delicious. I wouldn’t describe myself as the world’s biggest carnivore (although I know several people with a decent shot at that title), but some nights you just want red meat and iron and this was that night and that dish was in the right place at the right time. It wasn’t perfect, mind you. The chops were so long and thin that eating them was unwieldy, as was pushing the bone out of the way when you were done. They came with watercress, which I can take or leave, and a salsa verde which fell into the same trap as the tartare sauce. I could admire it, this glossy smear of fresh mint and oil, but I wanted some vinegar in there, some sharpness to stop my mouth being coated with fat (I’m well aware, writing this, that I’ve gone to Coppa Club and said that two of the dishes could have been improved with jars of sauce from Colman’s: judge away). 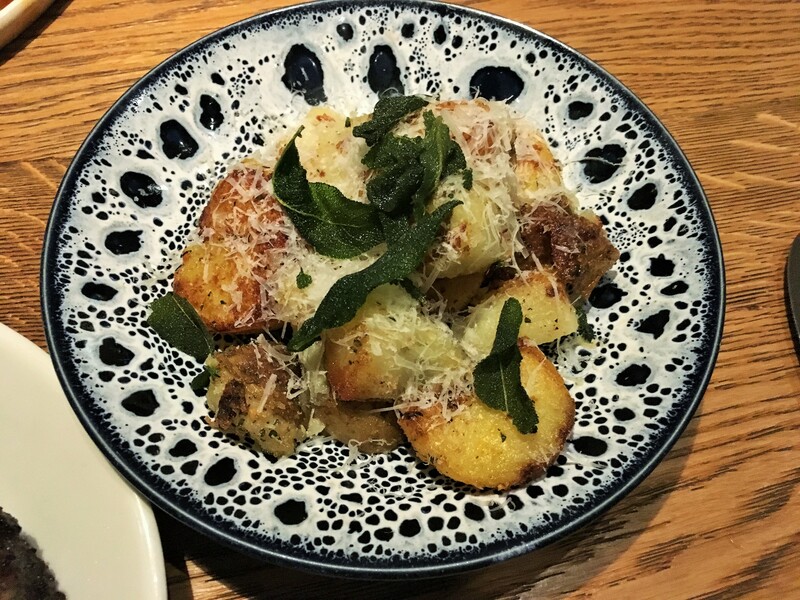 What did improve the lamb, immeasurably, were the “rustic potatoes” – little roasted potatoes, all crunchy corners and fluffy insides, festooned with Parmesan and shot through with green shards of fried sage; if they’d put those on the “nibbles” section of the menu I might have started and stopped right there. I really wanted to try pizza too, to see if Coppa Club was up there with all those pizzerias I daydream of dropping in Reading, and whether the “slow proved, sourdough base” would live up to billing. Well, sadly not really. The base was too thick in the wrong places, no bubbly edges and a stodgy, rather soggy middle. It tasted decent enough, but it was lacking that chewy, moreish flavour I expected from a sourdough base. There was a bit too much cheese, in my opinion, although I guess that’s better than the alternative. 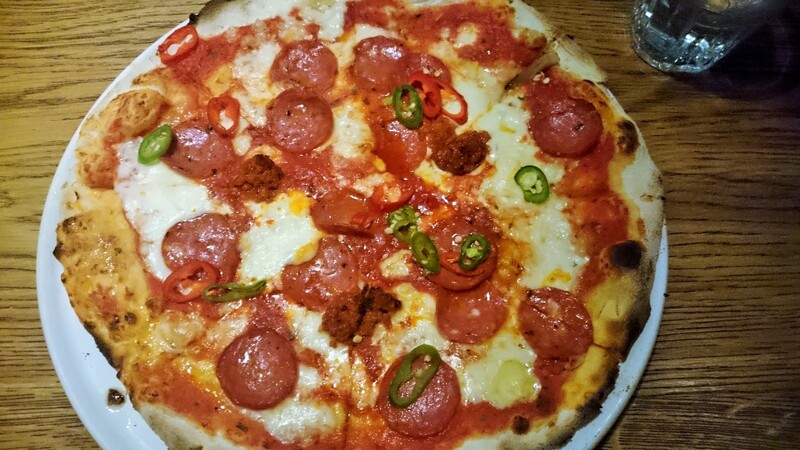 I went for the “Coppa Club Hot” and the ‘nduja on it was delicious, super-intense, punchy, salty, almost acrid. If only there had been more – I know a little goes a long way but three small teaspooned dots of it across the whole pizza still felt a little mean. The spicy salami was less successful, a bit more simple in flavour (although still with loads of heat) but personally I’d have liked it a little more crisp; maybe that would have happened if the pizza hadn’t been so thick. My guest didn’t eat more than half – after three slices I was told that it didn’t seem worth eating the rest of what was essentially a dolled up pepperoni pizza. 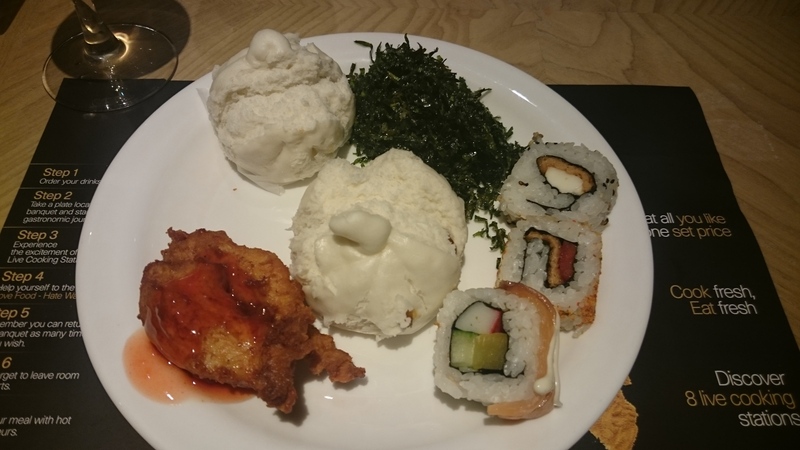 We didn’t stay for dessert – nothing quite appealed enough and by then I had been sufficiently irritated by my experience that I was quite comfortable leaving. A shame really, as one might have helped to tide me over in the inordinate wait for getting and paying the bill. Even waiting to ask for the bill, dessert menus in front of us, was an odd experience; one of the waiters cleared my folded napkin as he passed our table without actually speaking to us or making eye contact (which is quite hard to do, I think). In the end we had to call out to a passing waiter, who seemed to be cleaning up rather than actually, um, waiting. Dinner for two came to fifty pounds near as damnit and – and I almost never, ever do this – I did not tip. At the end of the meal my companion and I were discussing Coppa Club, not entirely sure what to make of it. I said I preferred it to Jamie’s Italian, my companion thought Jamie’s was better. We both agreed that if Coppa Club was in an easier location to get to we’d probably go back, but that it wasn’t quite enough to prompt a trip out to Sonning. Above all, the service baffled us both – how can a place work so hard at everything else and get that wrong? 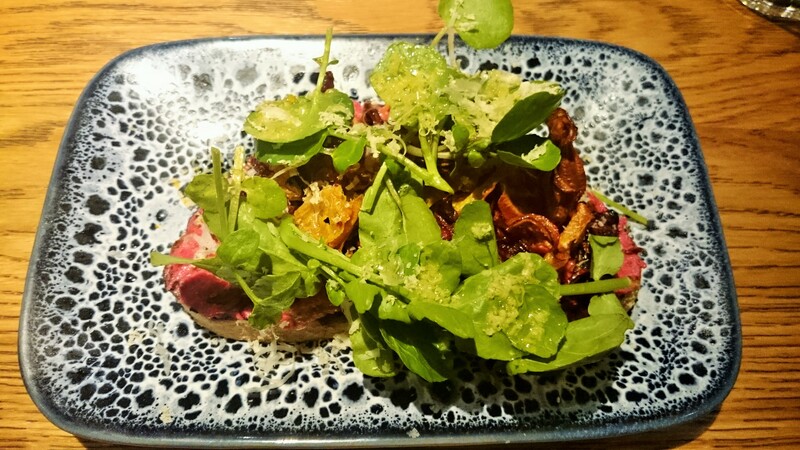 Since coming back, mulling it over and sitting down to write this, the power of Google has revealed several enthusiastic reviews of Coppa Club, with a few bloggers going and thoroughly enjoying it. Some of them had some of the dishes I had, so it was strange to read people waxing lyrical over the fritto misto, or the lamb chops. Only one of the reviews specifically said that it was comped, so it might be that people spending their own money really loved Coppa Club and I – with my slight grouchiness about service and seating, with a rustic potato on my shoulder – just took against it. But I wasn’t won over; there’s something irksome about a place that, however nice it might be, isn’t as good as it thinks it is. This might be hard for you to believe, but Reading isn’t perfect. Even I, with my bad habit of standing on the virtual soapbox and shouting about its best bits, know that. 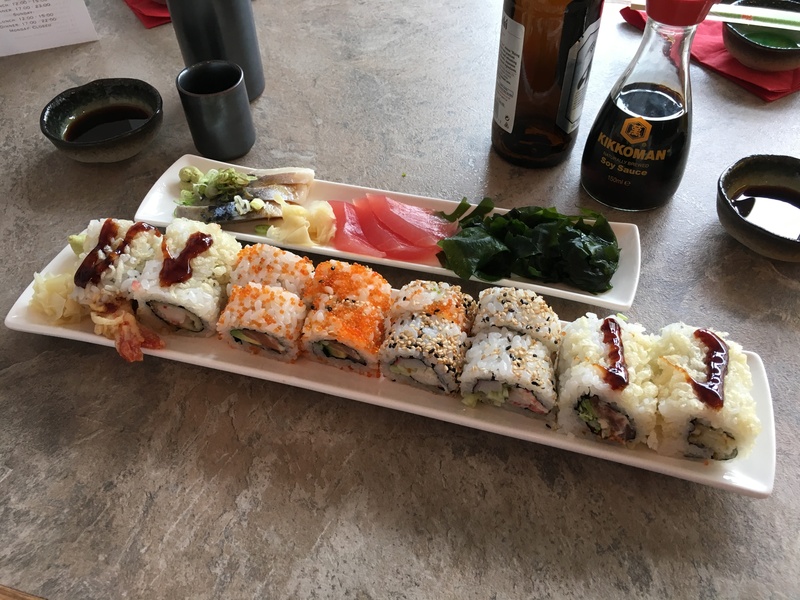 I’ve talked in the past about all the types of restaurants I’d love to see open in Reading, from indies to (some) chains, but this week instead of a review I thought I’d go one step further and talk about some of my favourite restaurants outside Reading. These are places I would love to pick up and plonk somewhere in town, even if I know in my heart of hearts that they wouldn’t necessarily fit in. This is by no means a list of the best restaurants anywhere, by the way. Often your favourite restaurant isn’t necessarily the best – the food might not be as flawless, the service might not be as polished, but simply put your favourite restaurants are the ones where you have the best times. Your mileage, should you ever get to one of this lot, will undoubtedly vary. And it’s not definitive, either: I missed out countless places in the interest of limiting this to half a dozen, including little bistros in Paris, sweet sun-kissed tavernas on Greek islands, Michelin starred joints deep in the Cotswolds and establishments from Toronto to Glasgow, from Prague to Istanbul. Loving restaurants is a wonderful thing, I think. Loving lists the way I do also brings a lot of joy. But trying to combine the two, it turns out, is rather an agonising pursuit. Reading doesn’t really have a proper French bistro. 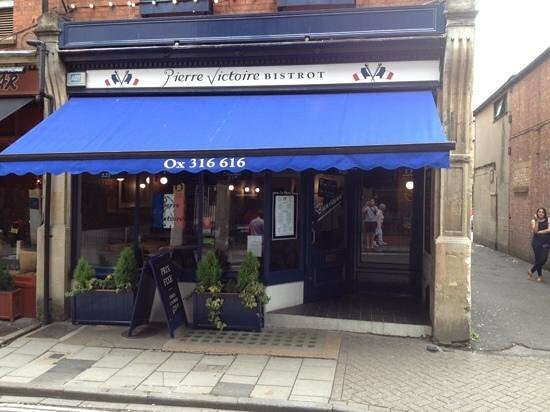 A few places have come close (and Brebis is only a train ride away) but you’d hope a town the size of Reading could sustain somewhere like Oxford’s Pierre Victoire. Originally part of a now defunct chain (which at one point included Reading, so maybe we don’t deserve another after all) this place has thrived by offering some great classics, an amazing value set menu (where starters and desserts are only two quid each. No really) and proper French service – you know, the sort where they always seem slightly amused by you but want to charm your socks off none the less. Despite being a pretty big restaurant, getting a table here is a real challenge unless you’ve booked ahead (which I singularly fail to do) so I sometimes end up eating here at lunch instead of dinner, just to make sure I do get to try it. On my most recent visit I tucked into a gorgeous quenelle of smooth chicken liver pate followed by a big stainless steel pot of moules marinière with skinny fries. I also nicked some of my companion’s potato rosti (sitting underneath a splendid, crispy confit duck leg) which would have been worth the price of admission alone. Lunch for two, including a crazily reasonable half bottle of Côtes du Rhône, came to thirty-six pounds. Thirty-six pounds! The tables are all squished together – which normally would annoy me, but here I like it because of the people-watching potential – and I never leave without wishing I could put Pierre’s in my pocket and bring it back on the train with me. Reading could really do with a little more ooh la la, n’est-ce pas? I know that London is arguably the most exciting dining scene in the world right now. I know that every cuisine is represented, to dazzling effect, and that every month new places open, shifting the dynamic of the place ever so slightly. It must be lovely to have all that on your doorstep to choose from, from the high end to street food with every permutation in between. I know all that, and yet – and I know this will make me sound like a hick from the sticks – I have had so many disappointing meals there you would not believe. I follow the critics, I ooh and aah over the meals (both the pictures in the papers and the ones they paint with their effortless sentences) and yet I’m so often underwhelmed. Whether it’s a neighbourhood restaurant a little off the Tube network, an old stager offering faded but charming grandeur or Michelin starred luxury on the top floor of some tall building, I often end up on the train back from Paddington thinking “what am I missing?”. Probably a lot, but what it means is that when I do go in I want to find somewhere central, reliable and decent that I can book in advance, where I won’t have to queue round the block for hours or spend two hours pretending I’m having more fun than I am. At the moment, for me, that place is Great Queen Street. Just off Drury Lane, part of a group which includes legendary Waterloo gastropub The Anchor & Hope and Oxford’s Magdalen Arms. It’s just perfect – dark, clubby, welcoming and totally disinterested in being cool. The menu is the kind of unpretentious list where you want to order practically everything and the wine list is full of inexpensive delights (plenty from the Languedoc, I’m happy to say). Last time I went, I shared a chicken, leek and tarragon pie, all rich creamy filling topped with flaky pastry but with that beautiful slightly soggy layer just beneath, like a business class Fray Bentos, and I liked it so much I nearly wept. I would say that once you eat there, you’ll never go back to Sweeney and Todd – but to be honest you could say the same once you eat at Sweeney and Todd. Despite discovering (if that’s even the right word, seeing as loads of you told me you loved it but just didn’t want me telling everyone) Papa Gee last year, I am still yearning for a comfy neighbourhood pizzeria. 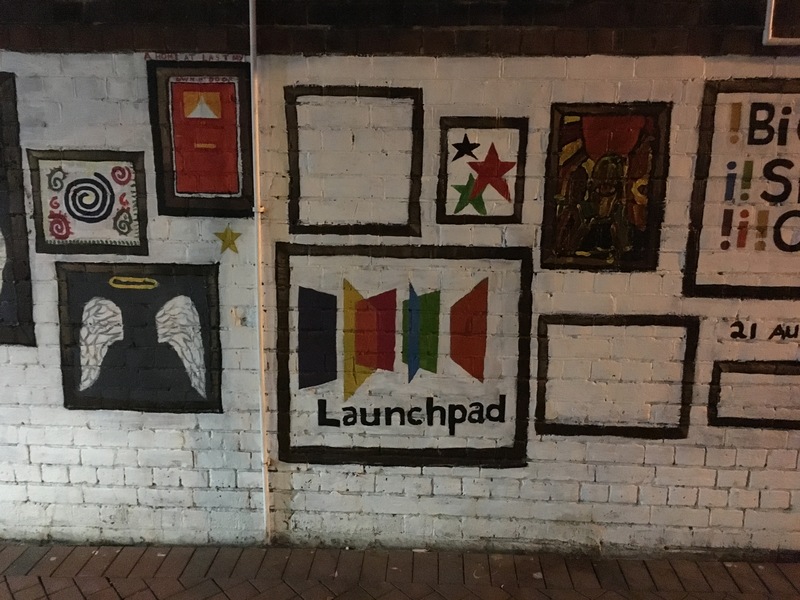 Well, I sort of found one, but the problem is that it’s on the Whiteladies Road in Bristol. And I always seem to end up there when I visit Bristol, despite it being a city with so many amazing restaurants (Wallfish in Clifton, for one, or the wonderful tapas restaurant Bravas). It’s not even Bristol’s coolest pizzeria – the up and coming Flour And Ash has taken that title – but it remains one of my favourite places to eat. 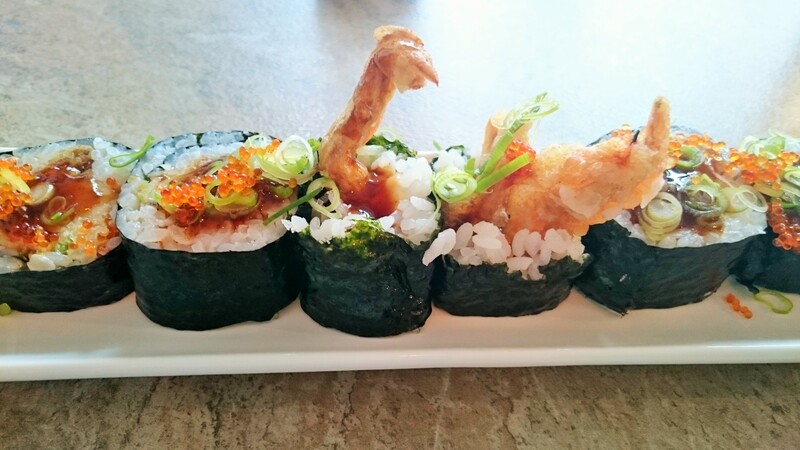 I’m normally there for lunch, but it’s the kind of restaurant that has perfected offering something for everyone, whether it’s small groups, dates or family outings. The menu is brilliant, with great antipasti (especially the burrata and coppa – to be honest I could gladly live off some combination of those two) leading up to the genuine highlight, the pizza. The base is light, chewy, ever so slightly charred and bubbly. The toppings are simple but steer clear of cliché. And – no small thing this – I love the service. It’s tattooed, passionate and informal (or, in a word, “Bristol”). I do rather collect pizzerias, especially abroad (La Briciola in Paris, Linko in Helsinki, I could go on) but there’s something about Bosco. Writing this now I can imagine sitting at a window table with some montepulciano, waiting for my pizza to arrive. And as much as I love Papa Gee, its slightly down at heel style and all, I’d love to see somewhere like Bosco dropped into one of the empty sites in the centre of Reading. That would be gert lush. 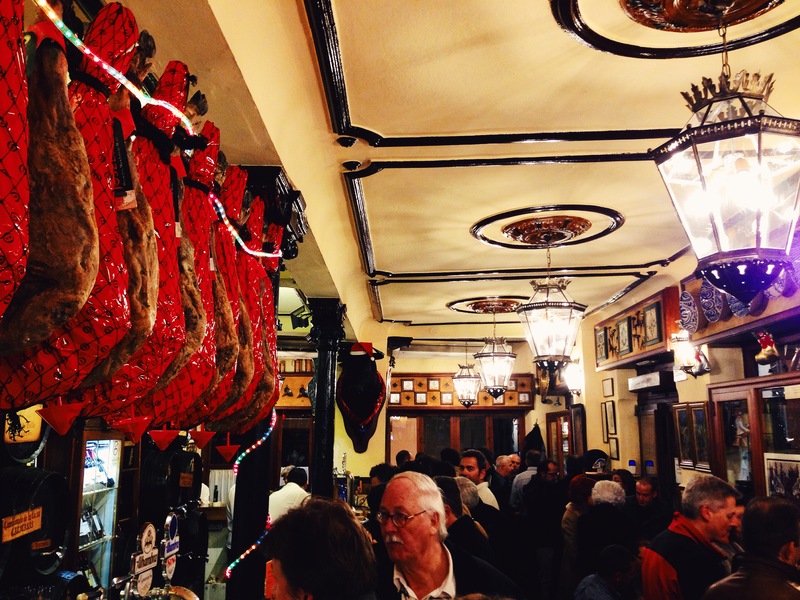 Granada is the true home of tapas, where every alcoholic drink is accompanied with a small plate of free food, be that a basic wedge of tortilla or a helping of salty, crumbly manchego. If you love food then that alone is reason enough to visit, even without a visit to the beautiful Alhambra, the stunning Moorish fortress which stands sentinel over the city from its position at the top of a very steep hill. Well, that and the sherry. And the wine. And the more sherry. Anyway, Bodegas Castañeda is in the heart of the city (one street along from, confusingly, an inferior establishment with almost exactly the same name) and, for me, it epitomises eating in Andalucia. Yes, there are still free tapas (the habas con jamon, broad beans with rich, savoury nuggets of ham, for instance) but the clientele here knows that the stuff you pay for is worth the jostling at the bar, which runs almost the entire length of the shallow, wide room. The staff, a wry bunch of super-efficient, slightly hangdog aproned men, serve sherry from large casks, pouring with a flourish that is more for entertainment than taste, and watching them work as a unit always fills me with admiration (and, probably more importantly, gratitude). You need your wits – and your elbows – about you to eat at Bodegas Castañeda, but the rewards are enormous: simple, savoury slices of the delicious jamon that hangs over the bar, thick pieces of mojama – cured tuna – topped with almonds and drizzled with olive oil, the saltiest bacalao draped over the smallest slices of bread, an embarrassment of riches. My mouth is watering now, something of a Pavlovian reflex which I get almost every time I think about Granada. All that and you can eat and drink like royalty (and get royally sloshed) at Bodegas Castañeda for less than forty euros, provided you’re happy to muck in and try speaking a little Spanish. Believe me, it’s worth the effort. I love Lisbon so much, and it has a much underrated food scene. Of course, there are the famous egg custard tarts and the port – everyone knows about those – but there’s so much more to it than that. Beautiful seafood, surprisingly good cheeses, petiscos that give any tapas out there a run for its money and my personal favourite, ginjinha, a rich sticky cherry liqueur sometimes served in (and you might want to brace yourself for this bit) an edible chocolate cup. Drink the liqueur, destroy the evidence, eat some chocolate into the bargain: trust me, some messy nights can begin this way. Despite that, my favourite restaurant in Lisbon is in many ways one of its most basic. 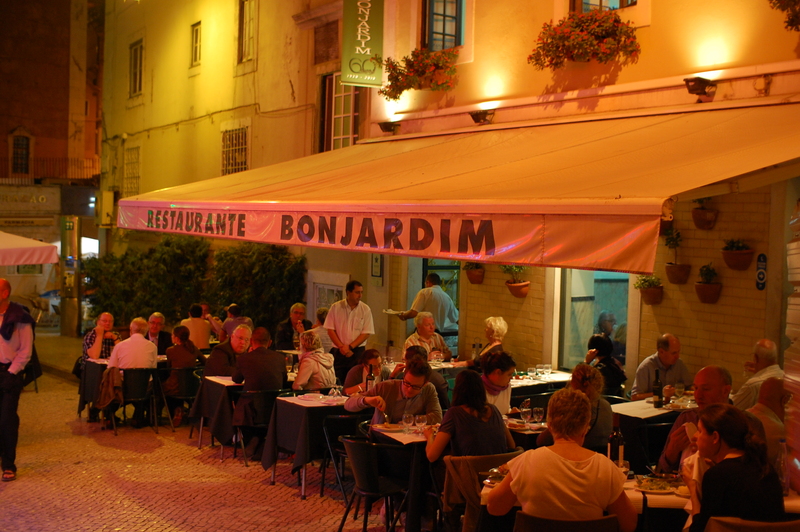 Bonjardim isn’t far from Rossio station, with a restaurants and tables on both sides of a little alley. It’s known as “Rei dos Frangos” (the king of chickens) and they aren’t kidding, because that’s what you order if you know what’s good for you. A whole spit-roasted chicken for two turns up with some slightly unnecessary chips, and it’s the most glorious, amazing, intoxicating thing. The skin has been rubbed with lemon, salt and oil until it’s almost brittle with the intense taste of wonderful crackling. Underneath, the meat is perfect; there’s a little pot of peri peri sauce you can brush on, if you feel that way inclined, but I’ve never seen the need. You just sit there, in the evening warmth, eating chicken and drinking wine or a frosted pint of Super Bock, watching the hawkers and the buskers wandering past on a seemingly eternal loop. Maybe we won’t ever get the weather, and it’s probably just my fanciful imagination, but I can picture something like this on Queen Victoria Street. I could have picked so many places in Barcelona for this piece. One of the finest meals I’ve ever had was in its Michelin starred restaurant Cinc Sentits, a meal so amazing that I wrote down every single course I ate in the tasting menu and for months after I could just get out the piece of paper, look at it and sigh. But last time I went, I found the strangest thing – the less informal a place was, the more fun I had. So although I enjoyed the proper old-school glamour of the “rich man’s paella” at Set Portes, the real delights came from the stand-up tapas joints, places like El Bitxo and the venerable El Xampanyet, where the waiters effortlessly swish from table to table offering to top you up with cava (and people think the Italians have a monopoly on offers you cannot refuse). This reached its apex at Can Paixano, a little bar on the edge of the old port on a seemingly lifeless sidestreet – a long thin room with no discernible furniture where people jostle at the bar for saucers of cava at little more than a Euro a glass. Meat hangs from the ceiling and the no-frills menu behind the grill tells you what’s on offer. You order some chorizo or morcilla and sip your drink (slightly off-dry rose cava for me, since you asked) while it’s sliced and grilled or fried in front of your very eyes. Last time I went, a group of young Irish chaps were there, clearly unable to believe their luck having chanced upon the place completely by accident. I bet they were wishing their home town had somewhere a little like Can Paixano: I know I was. So, those are some of my favourites. Why not chip in in the comments section and let me know some of yours?